Offering you a complete choice of products which include body wave hair weave, straight hair weave, french curly weave, water wave wig hair, body wave hair wig and water wavy hair wig. Lengths Available: 8 to 34"
Appearance: It gives bouncy and heavier looks. Due to waves, it appears shorter than straight hair of its usual length. Looks like moving snake and is best for Indian hair. Tangle tree: This hair texture is tangle free only if there is no dust inside. As the dust stuck in the hair due to more conditioner applied while making bodywaves, it can tangle. Hence, prevent it from dust. Shed Free: 100% shed free guarantee. Shine: More shiny appearance due to conditioner applied on this texture. Tight bodywave: Small waves, very popular in length of 20" or more. 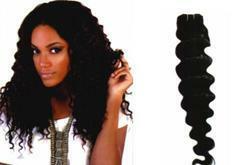 Looks beautiful when open or in Tight bodywave: Small waves, very popular in length of 20" or more. Looks beautiful when open or in ponytail. Avoid using blow dryers as it effects the bodywave curves. Justifying the standing we have built in this business realm we have been engrossed in presenting a wide consignment of Straight Hair Wig. The material used in its fabrication is of top notch quality and is well tested prior getting shipped. Together with this, these are stringently examined before getting shipped at the premises of our customers. Also, our customers can get these from us at market leading costs. Appearance Straight hair always has shiny, smooth and silky appearance! This hair is very soft and luxurious. This style is ideal for those who desire a sleek, straight look. It is suitable for any kind of dress like Indian, Indo-western, and open sequence etc. Any kind of cutting you can do with this hair. Tangle free - This hair is less prone to tangle and lasts longer than any other in the market. It needs low maintenance and less care. Shed Free - Sewing secures the weft and prevents it from shedding. This particular style has least shedding problems. Shine and luster - Natural shine and luster is retained because of the cuticle direction. Longevity - Lasts longer than any other hair because of the high quality. Yaki Straight: Yaki is the hair texture that is designed to look and feel like African American Hair remove the 'for black people'. 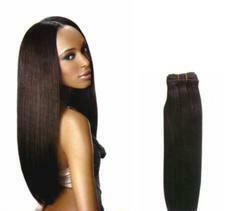 Silky Straight: Super fine and straight texture. Perfect match for European or Asian hair. High maintenance as you will need to take care to keep it straight. Hair has been freshly relaxed and flat ironed bone straight. Natural Straight: Natural appearance as no relaxing and ironing done. Natural straight texture depends on the country, heredity or environmental consequences. Always brush out your hair before washing. Always hold hair in a ponytail while brushing out the ends. For the rest of your hair, hold one hand firmly against scalp while brushing. Doing this will ensure less shedding and a longer life for your extension. Start combing from tail and move slowly upwards. Work the shampoo into your hair, scrubbing the scalp with your fingertips and being careful not to snarl the ends too much (i.e. piling it up on top of your head). Don scrub the hair during washing. Hair should not be shampooed daily. Twice a week if you can. After shampoo, conditioning is necessary. If you have oily hair, try not to scrub the scalp. This causes an overproduction of oil. Condition your hair. A good conditioner will help keep your hair healthy and will make it easier to detangle after shampooing. If you have dry hair you will need to use a moisturizing conditioner. However. if you have oily hair you should use a basic conditioner. Keep a wide-toothed comb in the shower and comb through your hair before you rinse the conditioner out to prevent over conditioning. Blot the hair with a towel, and comb it out once more. We recommend sleeping in a loose ponytail or braid to avoid any tangling from occurring through the night and daily to avoid knots and tangles. Add a few drops of honey to your conditioner to make it extra moisturizing. Try using a swim cap when you swim to prevent chlorine damage. Protect your hair from the sun by wearing a hat or looking for hair products that contain sunscreen. Hair ties should be the one without metal connectors. It is the most romantic. elegant curls which needs care. It is wavier than the Bodywave. Just scrunch and wear naturally or use your iron or rollers for more curl. Soft and shiny with so many great looks. Care for French curls: I think we should move the first bullet as last bullet. And it should say "this texture tends to be drier than others so might be more prone to be frizzy" to be drier than others so might be more prone to be frizzy"
Humidity can try to expand and swell the hair i.e. cuticle opening and trying to grab in the moisture. Curly hair does this more often so it needs more water to create stronger bonds. While styling curly hair, take your hair pieces and twist them around so you can create your own definition by twisting your curls and doing scrunching motion. When hair is wet it becomes wavy and after drying lazy curls moves up. The best way to maintain the curls is to moisturize during wet. This texture is a lot dried so more prone to frizzy. A soft wavy texture similar to large crimped style. Again suitable for longer lengths of 12 or more. Medium maintenance to maintain the waves which will require wrapping at night.